More than 40% of the women in the UK have bunions, a common deformity often blamed on wearing tight, narrow shoes, and high heels. Bunions may occur in families, but many are from wearing tight shoes. Nine out of ten bunions happen to women. Nine out of ten women wear shoes that are too small. Too-tight shoes can also cause other disabling foot problems like corns, calluses and hammertoes. Bunions are readily recognisable and will be confirmed by your Consultant. X-rays are often taken to look at the other bone structures in your foot. If you have a painful swollen lump on the outside of your foot near the base of your little toe, it may be a bunionette (tailor's bunion). You may also have a hard corn and painful bursitis in the same spot. A bunionette is very much like a bunion. Wearing shoes that are too tight may cause it. Get shoes that fit comfortably with a soft upper and a roomy toe box. In cases of persistent pain or severe deformity, surgical correction is possible. Most bunions are treatable without surgery. Prevention is always best. To minimize your chances of developing a bunion, never force your foot into a shoe that doesn't fit. Choose shoes that conform to the shape of your feet. Go for shoes with wide insteps, broad toes and soft soles. Avoid shoes that are short, tight or sharply pointed. If you already have a bunion, wear shoes that are roomy enough to not put pressure on it. This should relieve most of your pain. You may want to have your shoes stretched out professionally. You may also try protective pads to cushion the painful area. If your bunion has progressed to the point where you have difficulty walking, or experience pain despite accomodative shoes, you may need surgery. Bunion surgery realigns bone, ligaments, tendons and nerves so your big toe can be brought back to its correct position. Removal of the damaged portion of the joint, used mainly for patients who are older, have had previous bunion surgery, or have severe arthritis. This creates a flexible "scar" joint. 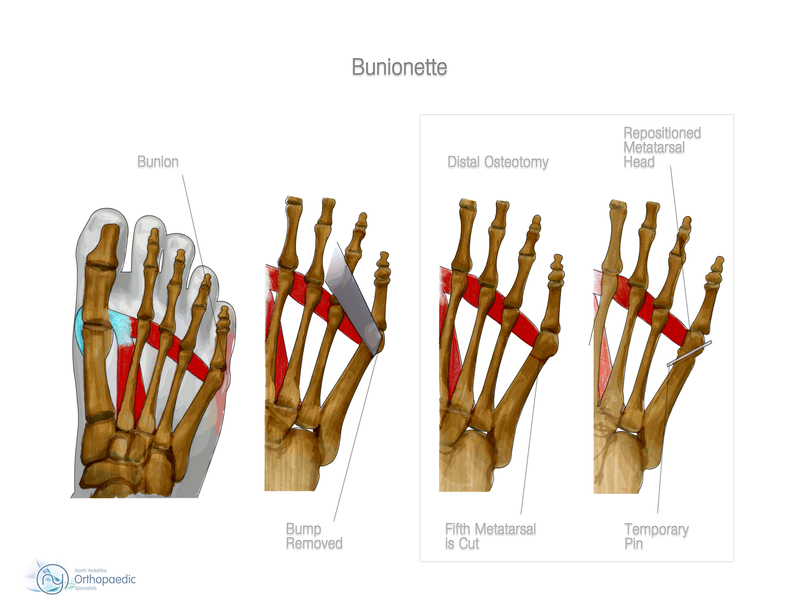 The surgical cutting and realignment of the joint. This applies equally well to a bunionette. Traditional bunion surgery involves making a cut of 5cm on the outside of the foot and a smaller incision on the inside of the toe to release the tissues holding the toe. The incisions used in minimally invasive surgery are just 3mm. Surgeons use instruments originally developed for head, face and neck surgery, which are very fine and rotate at high speed to make tiny, precise cuts. Small incisions are made in four places around the big toe, dividing the ligaments and cutting the bone with minimal damage to the surrounding tissue. These cuts are designed to allow the surgeon to correct the deformity but maintain bone stability in the area. A wire is then threaded through the incisions and used to lever the big toe back into the correct position. Once the toe is in the correct place, a small screw is implanted to fix it in this position. The screw is designed to stay within the bone without causing pain or being palpable for the patient in any way. The wire is then removed. The whole procedure, which takes place under general anaesthetic, takes 15 to 20 minutes. As there are numerous possible options for surgery, it is not possible to give exact guideslines on post-surgery rehabilitation. More often than not, surgery will be performed as a day case and you are able to go home soon after the operation. The anaesthetic will wear off after approximately 6 hours. Simple analgesia (pain killers) usually controls the pain and should be started before the anaesthetic has worn off. The dressing is removed soon after your operation. The wound is cleaned and redressed with a simple dressing. The sutures are removed at about 10 days. Everyone has different work environments. Returning to heavy manual labour should be prevented for approximately 4 - 6 weeks. Early return to heavy work may cause the tendons and nerve to scar into the released ligament. You will be given advice on your own particular situation by your Consultant.